This is our review of VPN.AC based on our real VPN tests from China. 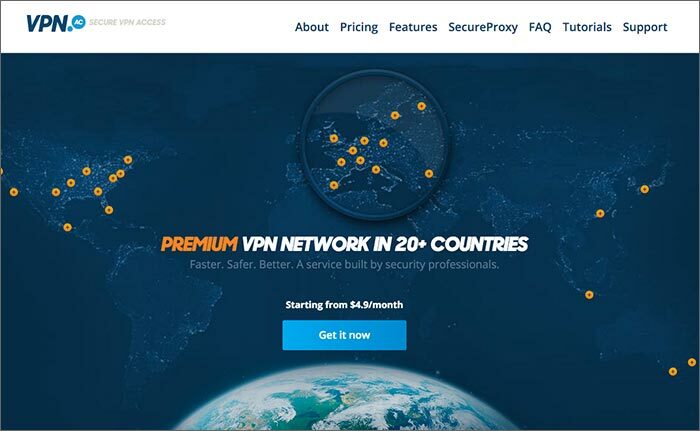 In addition to our VPN.ac review, we have also reviewed a number of other VPN services. If you are looking for a reliable VPN services to be used in China, Please also read our list of Best VPNs for China. VPN.ac is a VPN provider based in Romania. It provides world-wide server locations in many countries and supports all common VPN protocols. VPN.AC is not a big VPN provider and the company is not that close to China. 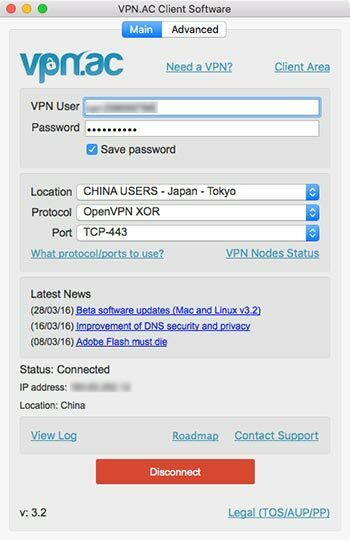 However, this VPN provider seems to have a lot of experience serving customers in China. After we signed up for their account, the welcome email we received pointed us to their special instruction for China users, which contains information such as which VPN protocols and VPN servers work better in China, as well as suggestions on how to configure DNS servers etc. In the server location list of VPN.ac’s client software, there’re about 25 locations prefixed with the text “CHINA USERS”, which indicates those servers are optimized for China users. Based on our tests, we confirm that users can sign up for VPN.AC’s services from China and VPN.AC’s VPN service can be used in China. VPN.AC accept Alipay and UnionPay as valid payment methods for signing up their service, which is convenient for China VPN users. VPN.ac offers multiple VPN protocol types such as OpenVPN, L2TP/IPSec, PPTP and has multiple VPN nodes in 18 countries, including US, UK, Hong Kong, Japan, Singapore and more. Compared to most major VPN providers, which only allow 1 to 3 simultaneous connections, VPN.ac users can have up to 6 simultaneous connections. Besides, VPN.ac allows P2P/torrent traffic, which is prohibited by many other VPN providers. VPN.ac’s OpenVPN service also works with custom firmwares like DD-WRT and TomatoUSB on supported routers. In addition to VPN.AC’s VPN service, it also provides a proxy service called SecureProxy, which can be set up on web browsers such as Chrome, Firefox and Opera as browser extensions or addons. One nice thing about VPN.AC’s SecureProxy is that it’s stealth again firewall/DPI, meaning that it can bypass VPN blocking in China. We’ve tried VPN.AC’s SecureProxy and it worked pretty well in China. VPN.ac’s users pay $4.8/month if they pay annually. If you order the service month by month, the price is $9/month. 7 days money back guarantee is offered with a full refund. After using VPN.ac for less than 7 days, we tested their cancellation process and the it seemed to be hassle-free. After we sent out a cancellation request,we received a cancellation confirmation email within hours. we did need to cancel our Paypal recurring payment by ourselves, but a Paypal link was provided in their confirmation email and we were able to get our refund and cancel our Paypal recurring payment with 1 click. After we signed up with a VPN.ac account, we downloaded their desktop client software for Mac. When using the software for the first time, you have to enter your VPN user name and password and you can save it for later use. BTW, when we signed up, we I were not able to choose a username by ourselves. Instead, we were assigned a seemingly random username by VPN.ac. If you want to change your username to a more memorable one, you have to contact their support because there’s no place in their client area to so do. We were told by the VPN.ac support team that this was designed for protecting user’s privacy. VPN.ac’s client software has a clear interface and it’s easy to understand and use. You can switch connection protocols, changing servers and connect/disconnect VPN. Then we used VPN.ac’s Mac desktop client to connect to their Tokyo server using the OpenVPN XOR protocol. We got a download speed is 14 Mb/s, which was a quite good speed for surfing the Internet as well as watching online videos. The SpeedTest.net testing result is shown below. On VPN.ac’s website, there’s a live Chat window for communicating with their customer support team. However, a text saying “live help is offline” is showing every time we visit their site. When you open up the chat window, you will be asked to fill out a form with your email and questions. We tried asking questions this way and we were able to get answers within a short time. VPN.ac is not a big VPN provider. However, it seems to have a lot of experience serving users in China. Its connections are pretty stable and and speed is quite fast. Unlike many VPN providers which only allow 1-3 simultaneous connections, VPN.ac allows its users to connect to up to 6 devices at the same time. If you are looking for a VPN service to be used in China, especially if you need to connect to multiple devices at the same time, you can give VPN.ac a try. This entry was posted in VPN Reviews and tagged review, vpn.ac. Bookmark the permalink.